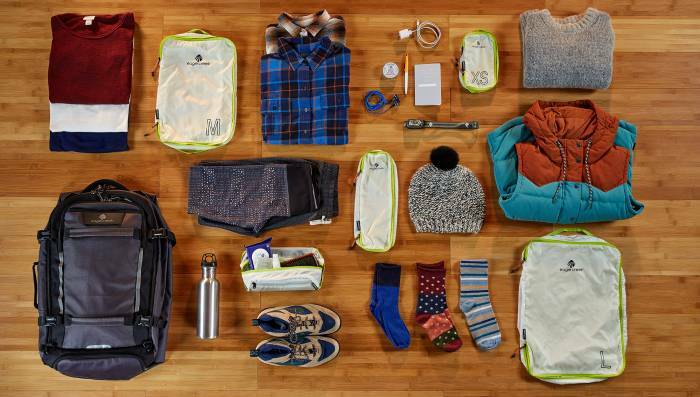 Perfect packing is possible, and we made a list for it. Check these off before gearing up for a faraway trip this year. Here at GearJunkie, travel is an integral part of what we do. We culled these 15 packing tips from our experiences on the road, including mistakes we made over the years traveling to the Rocky Mountains or as far as Kathmandu. Print out all important documents for a trip, including hotel reservations, rental car info, directions, and any contacts. (Don’t rely solely on digital copies on a phone.) Make a photocopy of your passport and store it in a different part of your luggage than your real passport; in a worst-case scenario, you’ll have a backup. Before you leave, take all credit and ID cards from your wallet or purse, lay them on a table, and take a photo. Shoot the front and back of all the cards and IDs. You’ll then have a backup digital record in case your wallet goes missing on the road. Overpacking clothes is a top violation of adventure travel. Before you start shoving everything into your bag, ask, “Do I really need three pairs of jeans?” Many travelers wear the same clothes multiple days in a row (we sure do), which significantly cuts down on pack/luggage weight and the hassle of managing a wardrobe on your trip. Avoid cotton, since it’s mostly wearable one or two days before needing a wash. We often bring shirts made of merino wool, as they’re wearable multiple days in a row and work across a range of temps. Another option is clothing treated with Polygeine, which doesn’t need to be washed as often. Rolling luggage is de rigueur for air travelers. But if you’re hopping off an airplane to walk, bike, trek, or explore, then wheeled luggage quickly becomes a hassle. 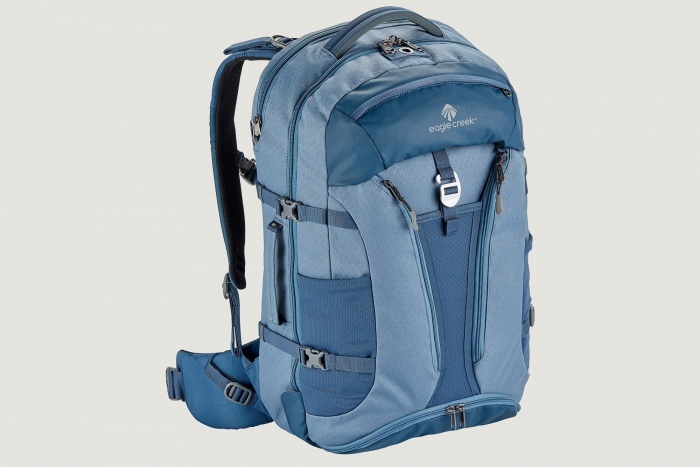 Use backpacks instead, including made-for-travel packs like the Eagle Creek Global Companion (photo above). Computers, cameras, and any breakables should not be packed in luggage going into the belly of the plane. Keep those items in the above-seat bin on a plane or in a pack stuffed under the seat so you can protect them on the go. Rainy days can ruin trips. Make the most out of each day by packing the right clothing, rain jackets included. Especially in the desert or high country, check the forecast to make sure you are covered. Long flights are requisite for many trips. Think ahead and dress for the occasion. Wear comfortable clothing and include layers to strip off or add, as the temperature in many planes is unpredictable from hot to cold. Also consider a hat, earplugs, eye mask, and a neck pillow on flights longer than a couple hours, where you can sleep. Bringing food from home lets you avoid paying ridiculously high prices at the airport for processed junk. Be the envy of the aircraft with fresh food from home. When everyone else eats airline peanuts, pull out a fresh box of blueberries. Most data plans don’t work or charge expensively when traveling internationally. Instead, buy a pre-paid SIM card or cheap phone at your destination. With a phone, you can worry less about losing your travel partner, use GPS, post photos and travel updates, and call for Uber or Lyft rides in cities. Will you have time to visit a gift shop or local market? If you’re a gift-giver, pack an empty, lightweight bag or pack within your luggage. Use this extra pack or bag if you can’t fit everything on the way home. Odor from dirty clothes and shoes can seep into your clean clothes and have you spending time at a laundromat instead of adventuring. Use a product like a Shoe Sac, or even a plastic bag, to keep the clean separate from the dirty. Storing them in a separate bag or compartment of your pack is a simple hack to mitigate the funk. Some travel-specific gear comes with an integrated rain jacket pocket or shoe container. Eagle Creek’s Global Companion 40 has two zippered storage pockets to separate the dirty from the clean. Travel-size toiletries are sold at most drugstores or groceries. Stock up on 3-ounce (or smaller) shampoo, soap, toothpaste, deodorant, and other needed personal items. The made-for-travel sizes will pass through airline security and offer enough quantity to service a traveler for a week or more on the road. –This article is sponsored by Eagle Creek. Check out the brand’s travel pack – the Global Companion 40L – to help perfect your packing.